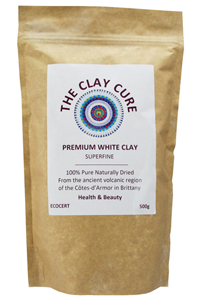 The Clay Cure Company Premium Superfine White Kaolin Clay is rich in silicon and aluminium silicate and is renowned for being the mildest of all clays. Premium Superfine White Kaolin Clay is high grade, ultra pure and clean. Its mild and versatile properties makes it ideal for all skin types, from babies to the more elderly. White Kaolin Clay is beneficial for managing certain skin conditions and is also efficient at improving circulation to your skin. 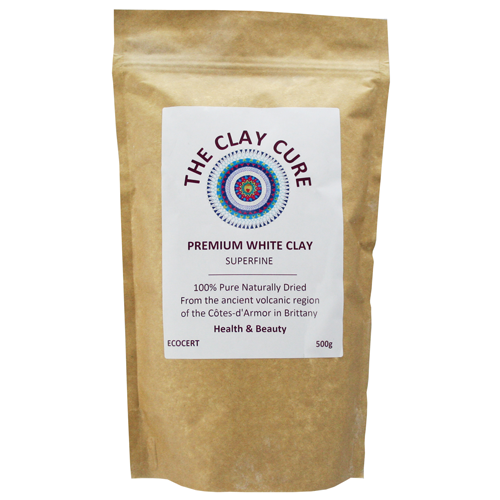 In addition, white clay contains essential and phyto-nutrients that protect and nourish the skin. Historically, Kaolin has been used to help purify, nourish, soothe and heal both internally as well as externally. Its use originated in ancient China but it was also prized by the Romans, Greeks, Egyptians and other native cultures for its medicinal value. Preparation of the clay paste: Put the desired quantity of clay into a glass or wooden container. Add spring water, using a non-metallic spoon, to obtain a smooth paste. Leave it to rest for about 15 minutes then apply to your skin. Once dry, rinse.